undervisningsressurs | Ut på tur! 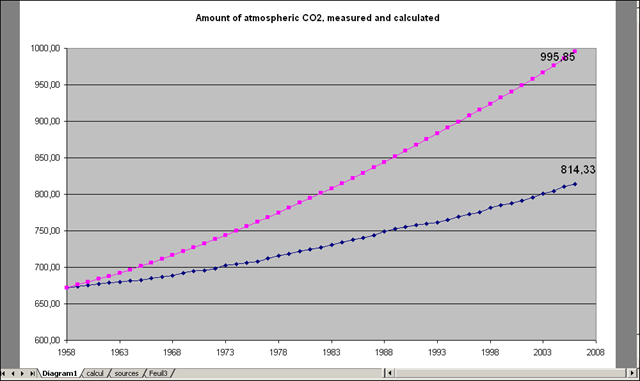 1958 was the first year that the total amount of atmospheric CO2 was measured, which is the reason for the start year for this simplistic model. 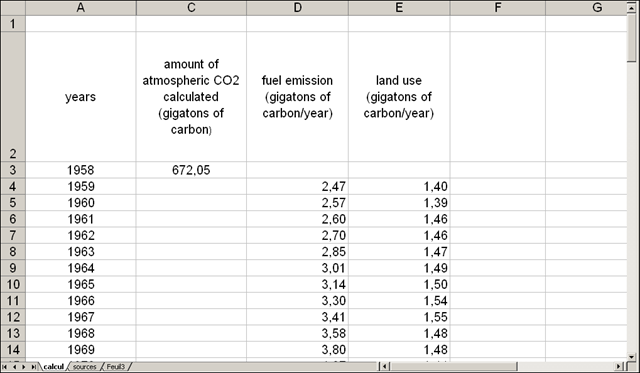 In this model you start by the total amount of atmospheric CO2, and after that you add fuel emission and land use. The first step is to add the emissions to the atmospheric amount. 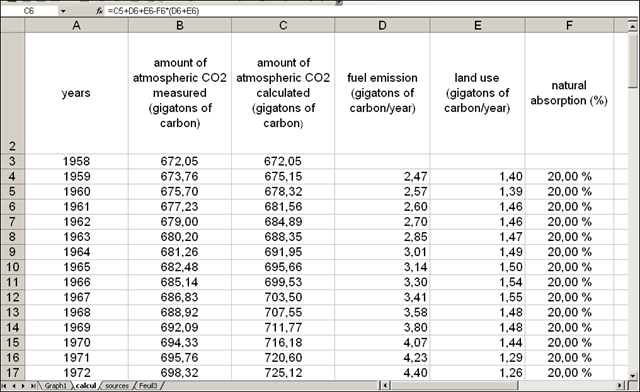 The second step would be to compare the measured and the calculated CO2 data. The students will then see that there in a gap between the measured and calculated values – CO2 must be absorbed somewhere else then in the atmosphere. The next step is to find a suitable value for the natural absorption, as a percentage of the emissions. This is a great introduction to climate modelling as a discussion theme with our students. Further on it would be possible to split natural absorption in absorption by the ocean and absorption by the vegetation. 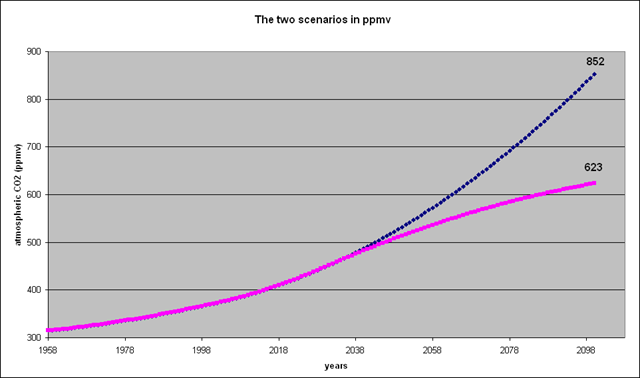 After making this model, it is now possible to include the prediction scenarios from the IPCC reports to calculate model results. It is also possible to get the students to make their own scenarios. My concluding remarks: This was an easy but fantastic way of introducing the principles of climate modelling! I look forward to try this with my own students next year 🙂 I also want to thank Marc for sharing his files with us. Through the CarboSchools collaboration there is made a website – SchoolCO2web. Mirko is teaching computer science and has used a weather station in the CarboSchools project. His students has worked on making a webpage with PHP and MySQL technology where they are displaying, analyzing and processing data from the weather station. The students has made a user platform and plotting functions. They’ve used a Vaisala weather station, it looks like a Davis weather station, maybe it is possible to connect the weather station we’ve bought in my school? Connection to CO2net program. The data needs to be sent via a ftp-server I need to check this with the ICT department in my school, if we have that possibility. The goal was to publish the important data, and to visualize them in a sensible way. Other schools are invited to comtribute with their data. Menno is a regional coordinator in the TSP and/or CarboSchools in the Netherlands. He showed us how we can use the SchoolCO2web. For instance if you plot the CO2 levels with windspeed, you might see the effect of mixing on the CO2 levels. This is a great resource for teachers! You can also download data from SchoolCO2web. Must remember that you can only download data for 1 month at a time. If you want to see videotutorials for displaying the data in Excel, Menno has published videotutorials at Youtube. May 1st – free time to finish my blog posts about the CarboSchools meeting in Pistoia. A short presentation of an experiment done with students at a school in Prato. They used an instrument for measuring CO2 in the schools classrooms with and without students, smoking areas, the school yard… The students also wanted to explore the difference in CO2 pressure with altitude – the school has four floors and the student did measurements in different heights. They presented their results at posters. 3 different schools outside of Barcelona – measuring CO2 at different altitudes, looking for difference between the coast and further up the mountain sides. Later the students will meet as scientists and exchange their results with each other. This was really interesting, I’d like to try some of this with my students, and maybe have a similar exchange with other schools in Bergen who teaches geo-science. I need more experience with the data loggers the school bought earlier this year. Three glass jars with lid. The lid has to have a hole to introduce the temperature sensor or the thermometer. To obtain CO2 there are two possibilities: mixing vinegar and sodic hydrogen carbonate or adding sugar to a mixture of warm water and yeast. To obtain water vapour we will use a beaker with water. You have to put a beaker with the mixture producing CO2 in a glass jar. Another beaker with water in another glass jar, and we also need an empty glass jar. You have to put the three jars in the Sun with the sensors or the thermometers inside. We need an extra sensor or thermometer to measure the outside temperature. Be careful to put it in a place that has only contact with the air. We will measure the initial temperature and the temperature changes every 5 minutes during 15 minutes if we are using thermometers or you can take continuous data if you have sensors. In each case note the temperature changes every 5 minutes.